There’s nothing like a high-revving four-cylinder bike that just makes a rider’s soul sing. Sure, all motorcycle engines are special, the heart and soul of our machines, but once you’ve ridden an inline four…you’ll understand. Especially if we’re talking about the one in the new Honda CB650R. Here’s a machine built for the pure joy of riding. It handles like a sportbike, but has all the comfort of a standard. And the way it looks—you can see that for yourself (but it’s like nothing you grew up with, that’s for sure). A genuine middleweight, it gets everything right, combining handling, nimbleness and rideability with responsiveness and crisp, edgy style. The new Honda CB650R. It’s truly about performance, and about how much fun you’ll have. 649cc DOHC Engine: Engines like this are what Honda does best. The four-cylinder design makes it smoother and faster revving than most twins, and offers ample low- to midrange torque, plus plenty of power through the entire rev range. Neo-Sports Café Styling: The CB650R looks unique because it’s a fresh, new design. The Neo Sports Café look combines elements from pure sportbikes and sporting nakeds. Sometimes less is more, and the CB650R makes a bold styling statement wherever you ride it. 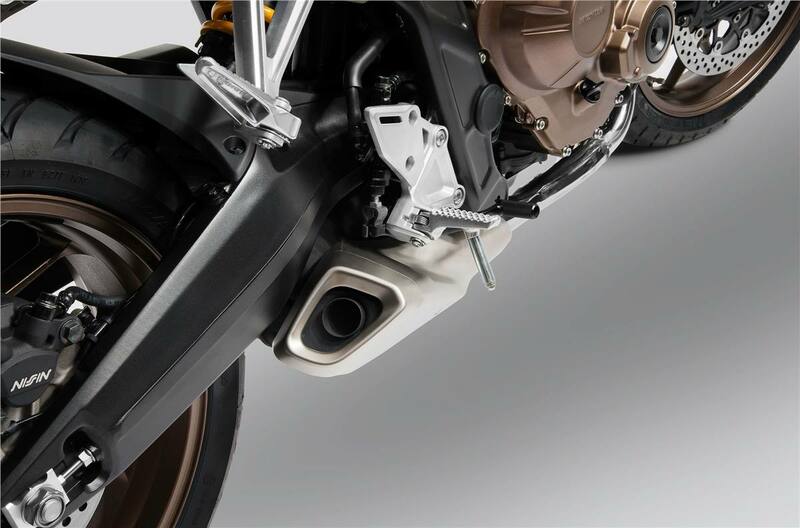 41mm Front Suspension: The CB650R’s front suspension showcases some leading-edge technology. The 41mm fork is equipped with Showa’s Separate Function Fork (SFF) which offers reduced weight, superior rigidity, and excellent overall performance. A new aluminum lower triple clamp completes the picture. 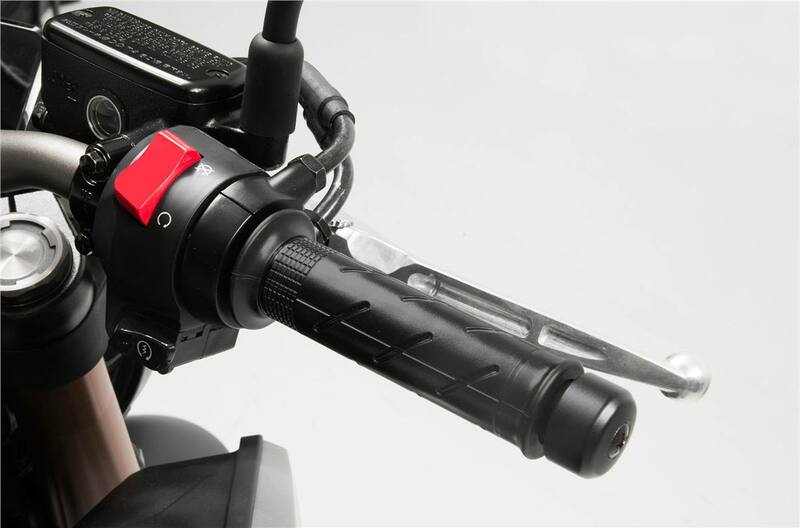 New Handlebar: A bike’s handlebar makes a huge difference in how you relate to your machine. We moved the CB650R’s bar forward by 13mm and down by 8mm (compared to the previous CB650F), and changed the bend in the bar too. Plus, using a premium, tapered-section swaged bar gives you better front-end feedback. Four-Into-One Exhaust: Power, style and an unmistakable growl—you get all three with the four-into-one exhaust system on the CB650R. 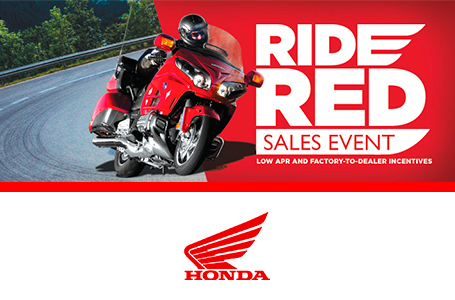 Six-Speed Transmission: Smooth, nearly seamless shifts and gear ratios matched to the way you want to ride: those are two of the characteristics that make this Honda so much fun to ride. 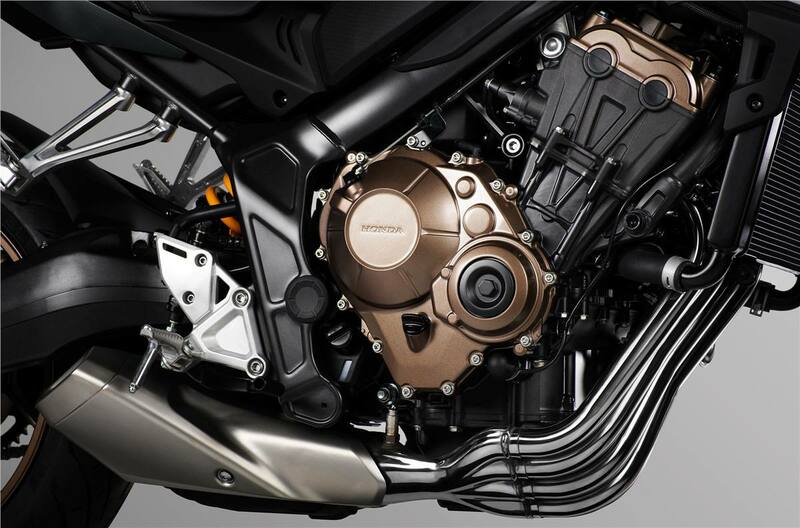 Refined Intake System: The CB650R features a twin-duct intake design, engineered to ram cool, dense air into the airbox, increasing horsepower. New Muffler: Mufflers need to accomplish four things: They need to quiet the engine without robbing power, they need to help tune engine output, they need to sound great, and they’re a huge style element on any bike. The CB650R’s exhaust knocks it out of the park on all counts, and sounds like only an inline four can. Special Engine Tuning: Changes to valve timing and piston shapes have improved engine response, especially from the idle to 8000 rpm, a big advantage in urban environments. 4.1-Gallon Fuel Tank: A bike as versatile as the CB650R needs plenty of range, and the 4.1-gallon fuel tank provides just that. Neo-Sports Café Styling: The CB650R looks unique because it’s a fresh, new design. The Neo-Sports Café look combines elements from pure sportbikes and sporting nakeds. Sometimes less is more, and the CB650R makes a bold styling statement wherever you ride it. Y-Spoke Aluminum Wheels: The new aluminum wheels feature “Y”-shaped spokes that help reduce unsprung weight. These lighter hoops have a greater influence on handling than the numbers alone suggest. 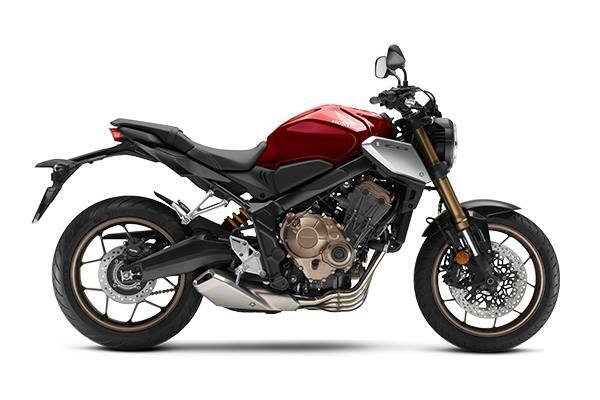 Trapezoidal Body Layout: It sounds like a mouthful, but it just means that the new CB650R has some awesome lines, and that it just flat out looks right. Lustrous Nanopigment Paint: The CB650R’s dual-layer candy paint is applied with a nanopigment clear coat on top of a base coat. Aluminum flakes in the base coat give this paint a shimmering look—check it our for yourself and you’ll be hooked. 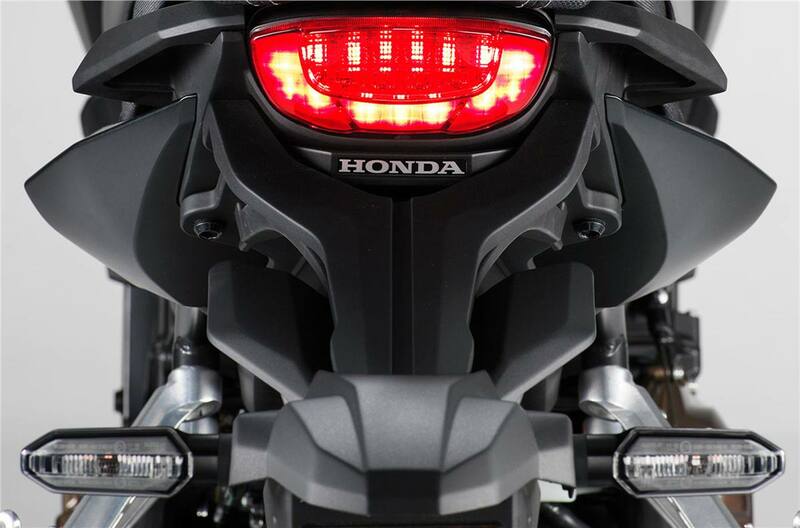 LED Headlight: The CB650R uses the same LED headlight as our CB1000R. The bezel around the headlight and is finished in black, emphasizing a sharper image. This LED headlight is both brighter and smaller than a conventional design, and contributes in a big way to the CB650R’s sense of style. 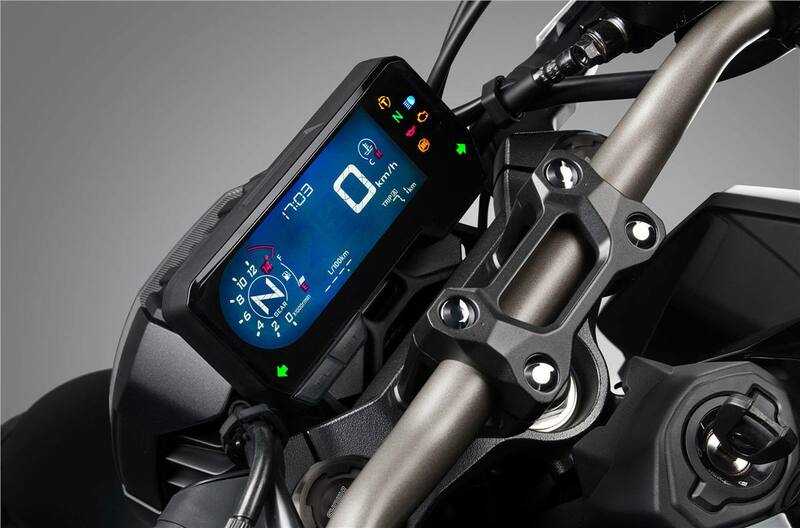 New Digital Instruments: Based off our CB1000R, the CB650R’s new LCD screen features a digital speedometer and tachometer and more, including a clock, odometer, trip meter, real-time and average fuel consumption meters, and illuminated engine diagnostic indicators. Slipper Clutch: The new assist slipper clutch lightens clutch operation by approximately 12 percent compared to previous models, and that reduces rear-wheel hop during rapid downshifts. New Frame: The new CB650R refines a classic Honda design. The twin-spar frame incorporates updated pivot plates, engine hangers, seat rails, and other components that all reduce weight. It’s light, strong, and provides the basis for the CB650R’s stellar handling. Radial-Mount Front Brakes: Featuring huge 310mm discs, the new CB650R also comes with radial-mounted four-piston calipers. The result is premium sportbike stopping power that’s linear and easy to modulate. Neutral/Sporting Riding Position: One of the most rider-friendly aspects of the whole Neo-Sports Café design is how you sit on the CB650R. You’re ready for aggressive riding, but you’re still comfortable. You can see what’s going on around you. And your riding sessions can last for hours at a time with little fatigue. Rake (Caster Angle): 25.5 deg. Emissions: Meets current EPA standards. California version meets current CARB standards and may differ slightly due to emissions equipment.